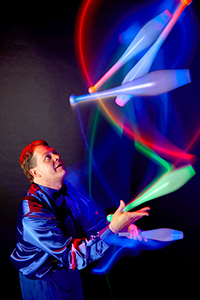 Give your guests an evening to remember with one of our outstanding jugglers. These talented performers are stand outs in their entertainment genre and sure to leave your guests with an outrageously fun experience. 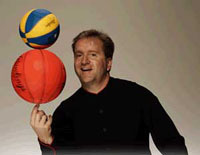 Let this talented juggler amaze your guests as he juggles everything from basketballs to bowling balls. His talent truly defies the laws of physics and is the perfect addition to any wedding reception, special event, intimate party, or grand opening celebration. 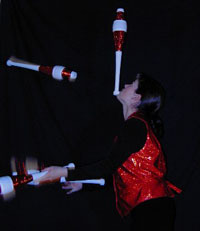 Let this multi-talented juggler amaze your guests as she dazzles your audience with her skill atop a unicycle or even while playing with fire. She is the perfect addition to any special event, intimate party, or grand opening celebration. This juggler delivers fun comedy with amazing juggling tricks. 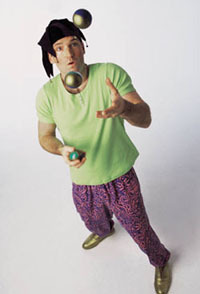 His act includes combination tricks seen nowhere else, bowling ball and sports juggling, and the dangerously fun weapons finale. Additional options include walk around entertainment for close up interaction and great visual, a stunning light show finale, fire juggling for beautiful danger outdoors, and a teambuilding with show and juggling lesson together.